Mainers voted to expand Medicaid last year. Could these states be next? Republicans in Congress may have relented on their attempts to repeal the entire Affordable Care Act, but the battle has shifted to states. Citizens in Idaho, Utah, Missouri and Nebraska have taken Medicaid expansion under the Affordable Care Act into their own hands via ballot initiative campaigns, hoping to force statewide votes to either adopt or reject expansion this coming November. Medicaid provides health coverage for more than 68 million Americans with low incomes or disabilities through federal and state programs. The far-reaching 2010 Affordable Care Act law, which expanded Medicaid coverage, was lambasted by conservatives as federal overreach. A 2012 Supreme Court ruling said that rather than being forced, states had to opt into Medicaid expansion. Since then, 32 states have done so. But 18 states have not. It’s been politically challenging for governors and legislators “who spent years railing against the federal overreach or the assaults on individual liberty in the ACA” to now back Medicaid expansion, said Matt Salo, executive director of the National Association of Medicaid Directors. But for many states “expanding Medicaid makes a lot of sense” since more people get coverage and the federal government pays nearly the full cost, said Ben Ippolito, a research fellow at the American Enterprise Institute who focuses on health economics. The campaigns to expand Medicaid via ballot have varied in scope and success. 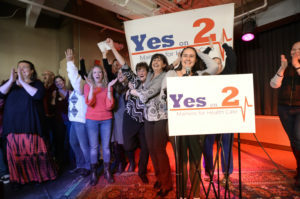 After Maine voters petitioned for and passed a first-of-its-kind expansion last November, campaigns in Idaho and Utah have gained momentum to expand Medicaid coverage. In Missouri, there was a longshot effort to gather 100,000 signatures to put expansion on the state ballot. The head of the campaign, Gary Peterson, couldn’t get the state Democratic party on board, only mustering support from local church groups. He told the PBS NewsHour that he suspended his campaign in February. And in Nebraska, residents launched a petition drive to appeal to voters this November after six consecutive years of failed legislation. Where is the fight over Medicaid expansion now, and where will it go next? Here’s what we know. Who exactly does Medicaid affect? In 24 states, at least 50 percent of births are financed by Medicaid, according to data compiled by the Kaiser Family Foundation. Medicaid also covers costs for about 62 percent of seniors living in nursing homes. The ACA’s Medicaid expansion raised the income limit on the program, allowing more people to qualify, and also allowed adults without children to enroll. The issue: In November, Medicaid expansion made the ballot in Maine — the first time this had occurred in any state since Congress passed the ACA in 2010. Fifty-nine percent of Mainers who voted supported expanding Medicaid, rebuking Republican Gov. Paul LePage, who had previously vetoed five expansion bills. On July 2, people will become eligible under the law. When asked whether the administration submitted the state plan by the deadline, LePage spokeswoman Julie Rabinowitz said that “we should not make a down payment without a plan to pay for the ongoing cost” and that LePage “laid out four simple principles to guide how to pay for expansion without jeopardizing the state’s long-term fiscal health,” referring to the December letter. If the administration shirks funding duties, Gideon said the state’s existing Medicaid funds “are enough to start getting people [from the expansion] online” until January. The campaign: In summer 2017, Luke Mayville drove his forest green 1977 Dodge Tioga RV, dubbed the “Medicaid mobile,” across Idaho to campaign for expanded health care access. His RV had been the rolling trademark of Reclaim Idaho, the organization coordinating the Medicaid expansion ballot initiative. The “Medicaid for Idaho” campaign began as “an awareness raising tour” with the founders touring the Medicaid mobile across Idaho to gauge and build support, Mayville said. An estimated 78,000 Idahoans fall into the Medicaid coverage gap — people with incomes too high to qualify for Medicaid, but too low to be eligible for the ACA subsidies that help buy coverage. What’s happening now: For Medicaid expansion to reach the ballot, the campaign must gather signatures from a total of 56,192 voters (six percent of the state’s 936,529 registered voters in the 2016 general election). They must also meet separate signature thresholds in just more than half of the state’s 35 legislative districts by May 1. What lawmakers say: Most of the state’s registered voters are Republican and the GOP-led Legislature stalled on expansion in the past. Republican Gov. Butch Otter presented his own plan, but it was pulled from the House floor in February. What’s next: So far, the campaign has accumulated about 40,000 signatures, leaving about three weeks to gather the remaining 16,000. Mayville said he believes Medicaid is a nonpartisan issue that people on either side of the aisle can sympathize with. “It really cuts across party lines,” he said. The campaign: Advocates have been pushing for Medicaid expansion in Utah for years. In 2016, drawn-out battles in the Legislature and governor’s office led to a limited expansion. But advocates like Utah Democratic Sen. Jim Dabakis called it “less than crumbs,” according to The Salt Lake Tribune. RyLee Curtis, campaign manager of Utah Decides Healthcare, the organization coordinating Utah’s Medicaid expansion ballot initiative, said early efforts she was involved with attracted the attention of The Fairness Project, a nonprofit organization that supports ballot initiatives on issues such as raising the minimum wage and expanding Medicaid. The organization has provided more than 90 percent of Utah Decides’ roughly $900,000 in contributions, much of which has been spent on signature gathering, according to public records. What’s happening now: Paid canvassers and volunteers have racked up more than 130,000 signatures to date. What lawmakers say: At the same time, the state Legislature passed a new partial expansion last month that is estimated to cover about 70,000 low-income Utahns in the Medicaid gap, The Salt Lake Tribune reported. For states that undergo full ACA Medicaid expansion, the federal government funds 90 percent of its costs while the state finances the rest. But this partial expansion, which includes a work requirement, must get federal approval for that same 90 percent federal funding. The campaign: Proposals have been introduced into the Nebraska Legislature for six consecutive years — all have failed. So one state senator and a group of Nebraskans are trying different approaches. A petition drive kicked off last month to put Medicaid expansion on the ballot. Insure the Good Life, the organization leading the charge, and local media outlets have said that expanding Medicaid would provide coverage for about 90,000 additional Nebraskans. Gershon, 35, has been battling chronic health problems since college and around that time lost her health coverage. She said she “went so long without [health] care” that she became gravely ill, but was eventually able to get Medicaid through disability. Even after being approved for disability it took another nine months of paperwork to qualify for Medicaid, Gershon said. “I really don’t want to see anybody else have to go down that same road to get the health care they need,” Gershon added. What lawmakers say: Nebraska’s governors have staunchly opposed Medicaid expansion. Republican Gov. Pete Ricketts has a slew of lengthy statements outlining his objections to Medicaid expansion and decrying attempts by the Legislature to expand coverage. But 32-year-old state Sen. Adam Morfeld, a Democrat, proposed a state constitutional amendment that would also put expansion on the ballot. “Every year that we have tried on Medicaid expansion in this state, the people that are opposed to it have never come up with alternative solutions — the governor included,” Morfeld told the NewsHour. “[F]or thousands of people in my district who are low-income, working-class folks, it’s [current Nebraska health care] not only making them go bankrupt, they’re starting to die,” Morfeld said. His bill was referred to a committee. What’s next: Organizers will have until July 5 to collect about 85,000 valid signatures and meet thresholds in 38 of 93 Nebraska counties.